Carrie Hope Fletcher returns to the West End to star in a full-scale production of Heathers – The Musical, playing for a strictly limited season at The Other Palace. The musical previously appeared at the London venue in 2017, playing a sold-out, short run as a work-in-progress show starring Charlotte Wakefield. Now, the sassy musical returns, featuring new songs, new material and new classmates. Based on the 1988 cult classic, which starred Winona Ryder and Christian Slater, Heathers is set within the cruel halls of Westerberg High, where popularity is a matter of life and death. When Veronica Sawyer is taken under the wings of the beautiful and deadly Heathers, her dreams of escaping invisibility begin to come true. Award-winning actress and novelist Carrie Hope Fletcher stars as Veronica, after most recently appearing as Wednesday in The Addams Family national tour, which earned her a WhatsOnStage Award for Best Actress in a Musical. Previous credits include The Christmasaurus, Chitty Chitty Bang Bang and Les Miserables, as well as releasing her debut album When the Curtain Falls. Further casting includes Jamie Muscato as JD, Jodie Steele as Heather Chandler, T'Shan Williams as Heather Duke, Sophie Isaacs as Heather McNamara, Jenny O'Leary as Martha Dunnstock, Dominic Andersen as Ram Sweeney and Chris Chung as Kurt Kelly, as well as Edward Baruwa as Ram's Dad, Jon Boydon as Kurt's Dad and Rebecca Lock as Ms Fleming. Ensemble members include Lauren Drew, Charlotte Jaconelli, Alex James-Hatton, Olivia Moore and Sergio Pasquariello. 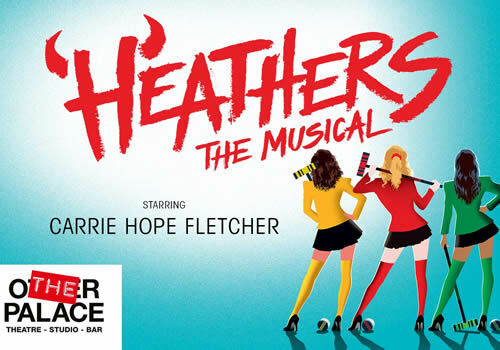 Heathers – The Musical features a book, music and lyrics by Kevin Murphy and Laurence O’Keefe, whose credits also include Legally Blonde the Musical. Directed by Andy Fickman, the production features choreography by Gary Lloyd, design by David Shields, lighting design by Ben Cracknell and sound design by Dan Samson. A thrilling new musical based on one of the greatest teen films of all time, Heathers – The Musical receives its premiere at The Other Palace and plays a strictly limited season from June 9th to August 4th 2018, with an official opening on June 12th 2018. So, are you in or are you out? Heathers the Musical is recommended for ages 14 and above.